Día de los Muertos, or Day of the Dead, is a traditional holiday celebrated in Mexico on November 1st and 2nd. It’s also celebrated in Mexican American culture in the United States and other Spanish-speaking countries such as Guatemala and Ecuador. The first day, called “Día de los Angelitos” or “Día de los Inocentes” (Day of the Little Angels or Day of the Innocents), is dedicated to the souls of children and infants, while the second day is dedicated to the souls of adults. 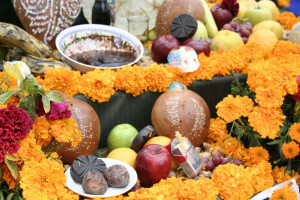 Families practice certain customs such as cleaning their homes or creating ofrendas (altars) to prepare for the arrival of deceased loved ones’ souls. Many also visit cemeteries to decorate family and friends’ graves with their favorite items and flowers. Graves and ofrendas (altars) are decorated with papel picado (brightly colored tissue paper cut in patterns), photographs, cherished objects, marigolds (cempasùchitl), and skeletons made of paper or clay. Food and drink are also offered. It’s believed that the dead can still enjoy the tastes and smells of the food. 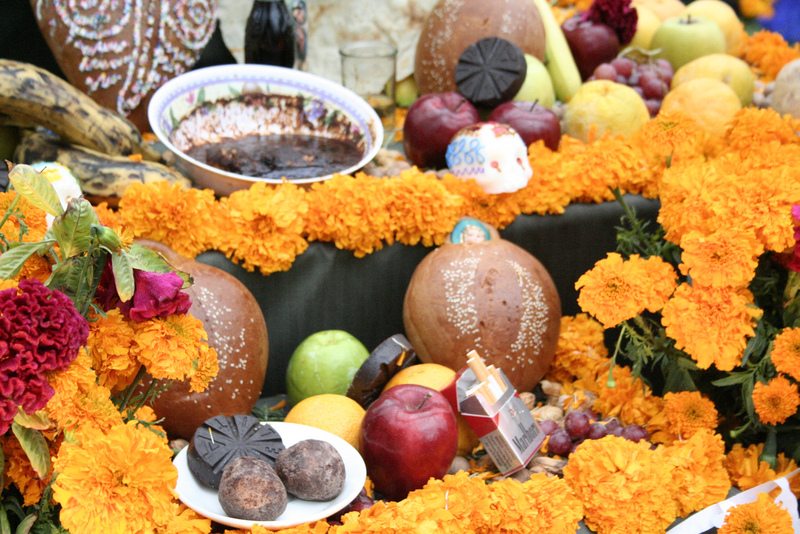 There are many important foods associated with Day of the Dead. The main dish is mole, which is meat (usually chicken or pork) cooked with a sauce made from chilies, chocolate, peans and other ingredients that vary by region. Pumpkin candies, rice pudding, and tamales are also prepared. Bakeries produce special bread called “pan de muerto” (bread of the dead) in the shape of people or bones. Sugar skulls are also traditional, although they are more decorative than edible. Below are various recipes we’ve found to help you celebrate Día de los Muertos! We encourage you to substitute our extra virgin olive oil whenever possible (instead of using vegetable oil) — although some of the recipes already call for a healthier EVOO. p.s. 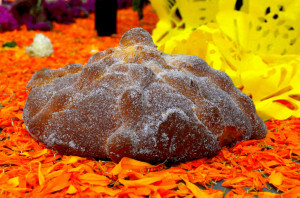 Pan de Muerto does not use any kind of oil, but we wanted to include it anyway, as it’s such an important food item for this holiday!